Slimbridge Wildfowl & Wetlands Trust (WWT) was extremely busy with visitors arriving before we’d even set up our stand in their foyer. As last year, WWT permitted us to celebrate International Dowsing Day, 4th May, by inviting visitors to have a go at dowsing. You could dowse for a WWT bird badge in the sand pit (yours to keep), or for the hidden object under one of three cups, a modern take on the ancient fairground scam of 'Find the Lady'. Dowsing was popular with children and adults alike, some of them doing extremely well at their first attempt. Anyone can dowse until we’re told we can’t, and youngsters seem to have a natural aptitude. 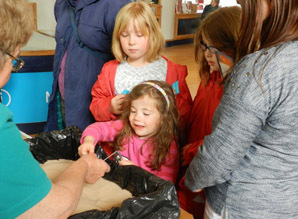 They particularly enjoyed the sandpit dowsing, and invented a completely new idea that even we, with all our years of experience, hadn't thought of. They used the wrong end of the dowsing rods as excavator buckets, ploughing through the sand looking for the WWT bird badges. Oh well, it planted seeds of interest in our future dowsers. We didn't mind, they seemed so excited and full of enjoyment. Several adults had a go and took a copy of our current Newsletter, so we look forward to welcoming them at our meetings soon. Our thanks to Peter Golding, our President, for making an appearance, and to Peter Gibson, one of our more experienced archaeological dowsing members, who kindly brought along diagrams of dowsing findings at Harts Barn, which we had visited the week before. During a quiet spell, he couldn’t resist doing a spot of dowsing, and his rods indicated there had been a watch tower on that very spot in Roman times. Also, our thanks to Slimbridge WWT for allowing Slimbridge Dowsing Group to celebrate International Dowsing Day in their foyer, another enjoyable success for all our members who supported the event, and for all members of the public that visited our stand.